Expecting to die on the 18th, Anne took the sacrament at 2 a.m. By now all who were in contact with her must have been convinced of her innocence. 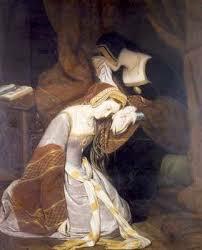 Even her old enemy Chapuys was impressed by the fact that Anne, before and after receiving the Sacrament, affirmed to those who had charge of her “on damnation of her soul, that she had never offended with her body against the King.” In the 16th century, to speak anything other than the truth at such a time would be to invite the utter condemnation of God. Anne had nothing to gain and her salvation to lose by lying. Anne too wished to have the thing done. Yet, cruelly, the execution was delayed twice, once in order to clear the Tower of possible sympathetic observers, the second time because the executioner had been delayed. The first delay dismayed Anne, who thought that at the newly appointed hour she would already “be dead and past my pain.” Kingston, who seems to have been an absurdly literal man, took her to be referring to the physical pain of the execution itself, and reassured her that “there would be no pain, it was so subtle.” Anne replied with her most famous line: “I have heard say the executioner is very good, and I have a little neck.” And then, according to Kingston, “she put her hand around [her neck], laughing heartily.” Kingston flat-footedly interpreted this to mean that Anne had “much joy and pleasure in death.” He apparently did not “get” Anne’s irony. At the news of the second delay, she was distraught. But “It was not that she desired death,” as she told Kingston (or perhaps one of the ladies, who then told him) “but she had thought herself prepared to die, and feared that the delay would weaken her resolve. “ So much for Kingston’s theory that Anne felt “joy and pleasure” at the prospect of death. 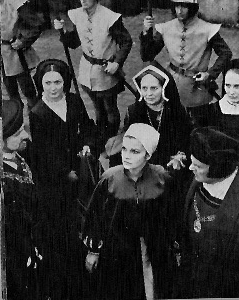 As she mounted the scaffold, wearing a role of dark damask (black in some reports, grey in others) trimmed with white fur, with a red kirtle (petticoat) underneath—red being the liturgical color of Catholic martyrdom—political and national affiliations continued, as they had through her reign and would for centuries to come–to shape the descriptions of her appearance and behavior. To an author of the Spanish Chronicle, she exhibited “a devilish spirit.” A Portuguese witness who had snuck in despite the ban on “strangers”, wrote that “never had she looked so beautiful.” An imperialist observer described her as “feeble and stupefied” (which would be understandable, and not incompatible with her looking beautiful as well.) Wriothesley says she showed “a goodly smiling countenance.” French de Carles commented on the beauty of her complexion, pure and clear as though cleansed by all the suffering. For all, the spectacle of a queen, wearing the white ermine of her role, mounting the stairs to the scaffold, was unnerving. Anne’s preparations for dying, facing the inevitability of her execution, may have been filled with internal good-byes to those she loved, relief at the shedding of a suffering self, or imaginings of meeting her God. I like to think of her final hours as immensely rich, in a way that I cannot comprehend but that were sustaining to her, even beyond her more conventional—but extremely deep, for Anne—religious faith. And then, at the end, I hope that nature or God (it makes no difference), gave her no more to figure out, no more to regret, no more to say good-bye to, no more work to do, and took care of her dying.